St. Andrews University Press, 9780999787304, 104pp. "How Birds Fly" wrestles with fundamental questions of how to adapt to the various roles in which we may find ourselves over the course of a lifetime--that of child, of spouse, of parent. There's nothing coy or hesitating about this collection. Each turn is as unexpected as it is precise, each image as emotionally resonant as it is intellectually complex. "How Birds Fly" is lived, honest, and true. --Charlotte Pense, author of "Many Small Fires" "How Birds Fly" is a tender, plain-spoken but impeccably-crafted book of poems that explore honestly what it is to be a father, a son, a husband, an x-ray technician in a hospital where one is daily confronted with pain and mortality. A job that, daily, changes him. 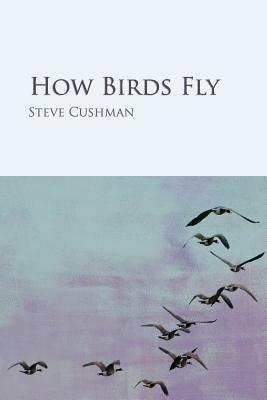 Steve Cushman weaves together these themes so skillfully that the poems in the book make a unified whole, each poem flowing into the next. And images of birds, sparrow, hawk, owl, pigeon, sapsucker run like a red thread through the pages holding them further together as if to remind us of the beauty and fragility of those winged creatures. Like life itself perhaps, as the father tells his small son in one gorgeous poem, "it's like magic, all of it." Each time I read this wonderful book, I loved it more. -Patricia Fargnoli.